This article is about the botanical genus. 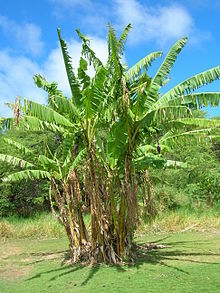 For cultivated plants, see Banana. Many bananas and plantains grow as high as trees, but they are not woody. Their apparent "stem" is made up of the bases of the huge leaf stalks. For this reason, they are technically gigantic herbs. Musa species are used as food plants by the larvae of some Lepidoptera species, including the giant leopard moth and other Hypercompe species, including H. albescens (only recorded on Musa), H. eridanus, and H. icasia. ↑ GRIN (2009-02-19). "Genus: Musa L." Taxonomy for Plants. National Germplasm Resources Laboratory, Beltsville, Maryland: USDA, ARS, National Genetic Resources Program. Retrieved 2011-02-06. This page was last changed on 1 July 2016, at 23:04.